If art dealer Michael Findlay had his way, smartphones would be banned from museum exhibitions. So would audio guides, wall labels and maybe even docents. “It all just gets in the way of what you’re seeing and depletes the experience of looking at art,” he says. In his forthcoming book, Seeing Slowly: Looking at Modern Art (Prestel), Findlay, a director at the venerable modern and contemporary Acquavella Galleries in New York since 2000, tackles a widespread phenomenon we might call Art Attention Deficit Disorder: the inability to cut out all the noise, inside and outside one’s head, and have a purely visual experience of a work of art. The point of having such an experience? Pleasure. “Our culture condones and even applauds men as well as women getting ‘carried away’ by music and even food, yet draws the line at art,” he writes. “It simply is not cool to get agitated in the presence of art. At least not in America.” The Scottish-born Findlay got his start in the 1960s in downtown Manhattan trying to convince collectors that Pop and conceptual art mattered, going on to run the department of Impressionist and modern art at Christie’s New York through the ups and downs of the 1980s and ’90s. In 2014, he published The Value of Art: Money, Power, Beauty (Prestel), which took on the tricky subject of art’s true worth. In advance of Seeing Slowly’s September 15 release, Introspective sat down with Findlay to discuss his pet peeves about museumgoers, how price tags cloud our vision and why art can make us happier if we just spend some time with it. What prompted you to write Seeing Slowly? I’ve been working on the book for around five years, but the idea first came to me in the late nineties, when I was walking around the “Early Picasso” exhibition at the Museum of Fine Arts, Boston, a wonderful exhibition. I was doing what I tell people to do — walk quickly through to the end and then walk backwards because the crowd thins — and I got to a point of extreme congestion. Most people had audio guides. Three ladies were there together, and one was quite literally spinning around, and she said very loudly, “I have no idea what I’m looking at, but it sounds great!” I never forgot that — this idea that she’s listening to the art. What a shame. 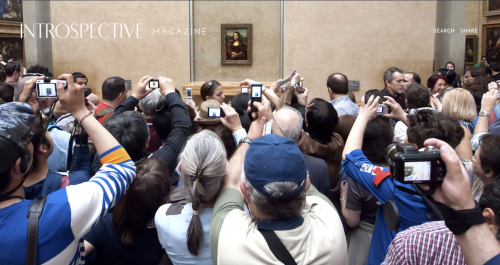 Since then, smartphones have taken over art spaces. They must drive you nuts. At art fairs, in particular, I began noticing people who were actually not looking at the art. They were looking at the label, and if the label told them something, they would then photograph the painting. In other words, they’d walk into the booth, they’d see Andy Warhol, Pablo Picasso, Jean-Michel Basquiat, they’d photograph those works, and then they’d leave. They didn’t actually look at the paintings. Were they taking photographs to post on social media? There is that, but they were also just establishing what they were doing. It’s an act of being there. It’s an act of saying, “I’m here” or “We’re here.” It’s a new way of experiencing life: You record it, even if you don’t post it or do anything with it. It seems that part of the problem is people looking at their screens rather than the object itself. I’ve seen interactive museum programs where you can have what you’re standing in front of on the iPad. So people are looking at the screen, not what’s on the wall. The Paul Cézanne here on the screen is brighter, backlit, it has more contrast. It has no texture or subtlety, but it is more commercially appealing. So we’re used to having things served to us like that. And it distracts from looking at the object in front of us. Why encourage people to “see slowly”? Same reason people listen to music, go to a play or a movie or read a novel — a combination of pleasure, celebration and communion with the artist’s expression. So, to enrich their lives? I’m not keen on the word enrich because it implies a purpose of profiting, which suggests the Protestant ethic of reward. I would like people to wander around museums looking for something they enjoy looking at rather than to be educated. Engaging with the work is its own reward, even if you don’t know what the hell it is or are unable to tell anyone about it. We need to be less purpose driven in our non-work lives, and we will see more, experience more and be grateful more, which will make us happier. And the wall labels, or educational background information, you don’t think they help people better understand and appreciate art? I’m not against information about art. Not at all. I can’t sell a painting without giving people information about it. But I’d like to reestablish the primacy of the visual experience. I think information should follow visual engagement. If you like it, you want to know more. But you don’t need to know in order to like it. Why do you need a label to say Frank Stella was experimenting with enamel paint? Or “Oh, this is 1982, before he took drugs, and he was wearing his hair like this.” OK, that’s cool, but do you like it? Enjoying art — even conceptual art — does not require any information or puzzle solving or training. Information on the label is not in the work. Some people might get overwhelmed in museums and need those labels to guide them. Willem de Kooning would often go to the Met with Franz Kline. They’d take time out of their studio, and they’d look at one painting. They’d decide on a painting. It could be an Old Master, whatever. They’d look at it for quite a long time, then go out to the park and sit on a bench and talk about it. De Kooning said that if you look at too many paintings you get all mixed up. Then it’s better to pick one or two things in a show you want to concentrate on and ignore the rest? Yes, look at what draws you visually. You write quite a bit about how children become programmed not to look at art but to listen about it. How does that happen? You will see people in the museum with children, standing around the works of art. The children are on the floor looking up, and the teacher is the voice of the painting. They are listening to her talk about the art rather than looking at it themselves. I think that’s horrendous. That all started with the invention of the art lecture and slide projector in the early 1900s — the art lecture, looking at slides and listening rather than looking at the object. Parents do it, too. They applaud their kids’ art until a certain age, when they start teaching them about “real” art. And then children, because of what their parents are saying at dinner about this Basquiat that sold for $110 million, they start coming into museums and galleries and asking, “What’s the most expensive painting?” Or they are thrilled because they can identify something. “That’s Picasso. I’m right, right?” They’ve won a prize. That’s good, but do you like it? By “liking” something, I take it you don’t mean finding it pleasant or easy on the eye, but that you expect “good” art to do more. One test for me is asking if something provokes emotion or thought or stays with you. Once you’ve gone home, did you leave it on the wall, or did it somehow come home with you? I want a jolt. I want a fix. I want art to affect my whole system. I got that rush from Mark Rothko, from Joseph Beuys. Everyone can find something that does that for them.